you forgot about wal sender and wal receiver processes. But you may remember that also exists the utility processes (optionals) WAL Sender and WAL Receiver. WAL Sender and WAL Receiver are the base of Streaming Replication. Thought to present them with Streaming Replication setup. True, it should be in the Architecture Overview diagram. I have altered the Diagram accordinlgy. I have a question, however. Does the Postmaster process spawn the utility processes? Or are they deamon processes that get run at startup? 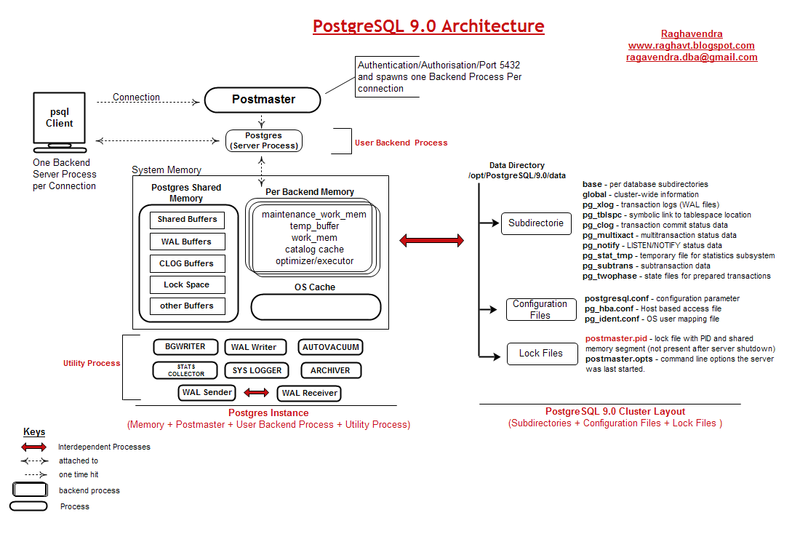 Postmaster itself a Daemon process, rest all utility processes starts along with it. Another Daemon kind of optional process is Autovacuum. Default is ON. Great post. So much easier to understand. :) Thank you. Thank you very much! Nice diagram! Why don't you add your blog to Planet PostgreSQL? Hi Raghvendra.. can you pls add some more details, regarding archiving and other processes too?.. Actually, today is my first day of learning PostgreSQL.. What I can understand is that WAL is like REDO Log Buffer in Oracle and WAL Files are like Redo log files. May I Know which processes writes Dirty WAL Buffers from WAL Buffer to WAL Files and how they get archived..? Finally! Searched this for ages (30min) - many thanks for the fine work, volker. Hello, I haven't found license for the schema (and some other You have published there). 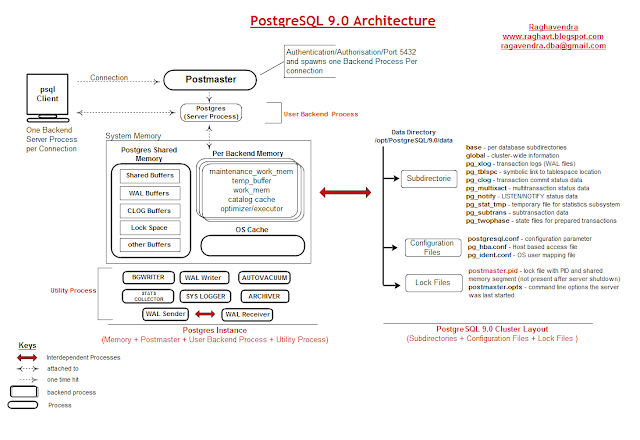 I'm trying to prepare a presentation for Oracle DBAs to show them differences and hlep with starting to use PostgreSQL. The schema is perfect, so I'd like to ask you to specify license or just give an approval to use the schema for educational purposes. Nice info, raghav. Could you update the 3 links in the article, please? Thank so much, It's useful article.